Neither does the voice of a poor woman. That is why we continue the struggle for women’s equal rights, especially the most disadvantaged. While we talk of the coming Fourth Industrial Revolution and the “digitization of everything”, we sometimes forget that many people are still struggling to move beyond the Second Industrial Revolution. The rights of women – roughly half the world’s population – to access the means to economic prosperity and the benefits of technology (as well as the protection from its dangers) will have a positive impact on the whole of society. Planning for success without planning for the rights of women is an unequal formula doomed to fail. According to the Institute for Women’s Policy Research , in 2015, female full-time, year-round American workers made only 80 cents for every dollar earned by their male counterparts. There’s also a gender gap when it comes to the fields women and men work in. For example, only 24% of people working in ICT around the world are women; in the field of computing and mathematics, only 23% of employees are women. We see the same trend playing out in Asia. In South-East Asia, for example, there are still considerably more men than women studying STEM (science, technology, engineering and mathematics) subjects; in Cambodia, 94% of doctoral students and 79% of researchers in this field are men . Ending global poverty means leaving no one behind. Studies suggest that if governments and businesses double the pace at which women are becoming digitally fluent, we could reach gender equality in the workplace by 2040 in developed nations and by 2060 in developing nations. 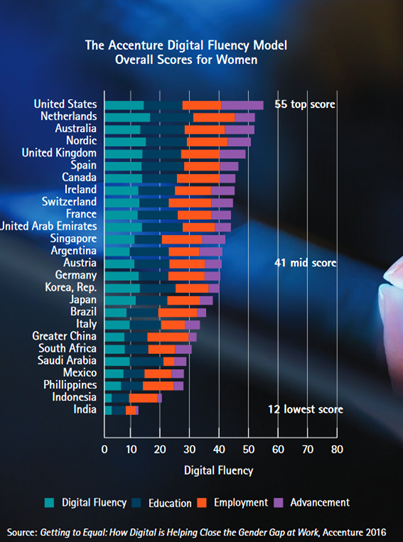 Using digital fluency modelling, the studies already show a correlation between nations with higher rates of digital fluency among women and corresponding rates of gender equality in the workplace. High-scoring countries in this area include the US, the Netherlands, Australia, the Nordic countries, and the UK. But what of the “bottom billion” poor who have no access to digital media and who make up an unskilled or low-skilled workforce? In 2016, around 70% of CARE’s work in Asia-Pacific was implemented with or through partners doing their part to address poverty and bridge the digital divide in the process. One of these is the Bintang Muda project in Indonesia that builds the capacity of young women entrepreneurs to market their products online, via Facebook, Twitter and WhatsApp. This included providing them with smartphones and training, as well as information on how to take photos and sell their products online. They have also learned how to develop attractive packaging to market their wares, generating a significant increase in income. In Cambodia, CHAT! Contraception integrates entertainment and technology to provide cost-effective and high-impact health education to young factory workers through a unique combination of hands-on training, relatable video dramas and mobile games. This integrated behaviour change communication package was created in 2015 and aims to improve the health of garment factory workers by empowering young women to make informed and healthy choices when it comes to their sexual health. It also provides them with access to reliable reproductive health services, helping prevent unplanned pregnancies, which in turn benefits factory management and productivity. The question of digitization, youth and equality is particularly pertinent for Asia. Nine of the 10 fastest growing megacities in the world are in Asia, and by 2020 almost half of South-East Asia’s population will be under 30. The Forum’s Internet for All initiative aims to connect tens of millions of new users to the internet around the world. Working with 50 partner organizations, the initiative will accelerate innovation, coordinate investment, strengthen policy environments and align development programming. As such initiatives are implemented, it will be particularly important to prioritise girls in this youth demographic. Feminism is not a fad. Men themselves in centuries past and from all cultures have been feminists: “No nation can rise to the height of glory unless your women are side by side with you,” said Muhammad Ali Jinnah , a lawyer and politician, who served as leader of the All-India Muslim League from 1913 until Pakistan’s creation on 14 August 1947, and then as Pakistan's first governor-general.